Jaded Blossom: Guest Designer, Karen! Karen from Simply Frenzied here, your Guest Designer for Jaded Blossom today! helping them celebrate their 1 year BIRTHDAY! You will find the Design Team inspiration, Mister Linky widget and learn how to win PRIZES! Thanks for stopping by today and I really hope you enjoyed my project. I know I enjoyed making it, using Jaded Blossom products and especially sharing it with you. Now it's your turn, be inspired to create something AMAZING! This is a great idea! I love the penguin with the mug as a decoration for a real mug! This is such an adorable project! LOVE the cute penguin!! I bet whomever receives this will LOVE it!! Very fun and cute gift idea! Pretty penguin coloring. Fun design with these winter candies & dies. Great idea!! There are lots of coffee drinkers out there who would love this!! Awesome job. TFS and thanks for being a guest designer. This is awesome Karen!! It's so cute! Did you give it away or keep it... I think mine would still be with me ;) Thanks for the wonderful idea!! Such a great lil project. Super cute. I LOVE this idea! I might have to try it sometime. This is such a great idea. I love the colors and how you added the flag die cuts to the topper as the cup holder. great ideas! thank you for sharing! This is so cute! Thanks for the idea! This is the perfect gift & can hold a Starbuck's gc! Love the coloring on the penguin!! I love it! 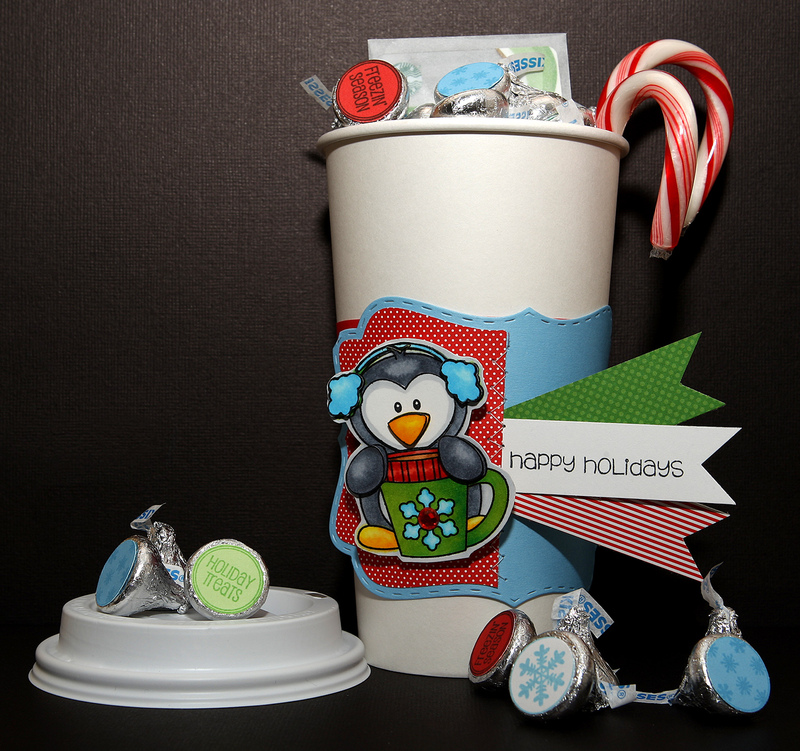 That fancy topper die is so versatile and the penguin is just so cute! I love this the colors the flag dies it just all works so well!! What a cute way to use the penguin. I love it. Such a great way to dress up a plain ol' cup for a gift! You ladies are just so full of creativity........Great project! LOVE how you colored the penguin!!!! He turned out super cute! And the whole project itself is amazing! Great job!! Great idea! Love how you used the topper! This is just too cute! Great job on the coloring and I love how you used the fancy die topper and flag dies! Great ideas. It is soo cute. SUPER CUTE! Your little penguin and kisses looks great! I LOVE how you did the flag dies. This is ridiculously cute!! Thanks for sharing which color Copics you used! Thanks so much for sharing! Goodness, is this cute or what? And your coloring of that adorable penguin is absolutely perfect! Super cute! perfect for the coffee lover or anyone else! This is super cute! I might have to make one for a friend. I just love this. Love that penguin!